Yesterday, we posted about Eric Gryba’s NHL debut and looked ahead to his skating against his former Terrier teammate Brian Strait in tonight’s Senators-Islanders matchup. But Strait’s season is likely over after he lost an edge and broke an ankle going hard into the boards on Saturday (Video). Acquired on waivers from Pittsburgh just before the delayed NHL season began, Strait immediately became a regular in the New York blueline corps, playing well enough to earn a three-year contract extension. 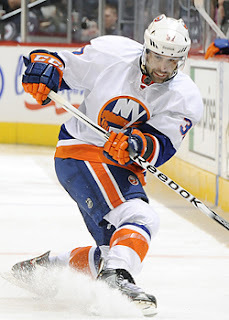 He was the only player on the Isles with a positive number (+3) in plus/minus. Gryba’s second NHL game yesterday was a solid effort in Ottawa’s 2-1 shootout win against the Devils, with the former Terrier logging 20+ minutes of ice time. Note—Apologies to former Terrier Ryan Whitney who was left off the list of BU defenseman in the NHL. That has been corrected. Hockey East’s playoff format will change next season when Notre Dame joins the conference and in 2014-15 when UConn comes aboard. All teams will participate in the playoffs. CHN’s Mike Machnik provides details. Senior Isabel Menard and junior co-captain Marie-Philip Poulin were named to the Hockey East top performers list. Each had a two-goal game this past weekend against Vermont and each scored a game-winner: Poulin on Saturday and Menard on Sunday. Despite sweeping Vermont, the Terriers dropped from third to fourth in the USCHO national poll.